The brand do still have the cropped, bright, stretchy stuff that makes any girl above the age of 25 (or trying to be) shudder. But once I'd got through that I found some amazing stuff. Firstly, I was pleasantly surprised by their trousers. Rather than the cheap, sweaty fabric you might expect these are thick, well structured and I feel like a million dollars in them. 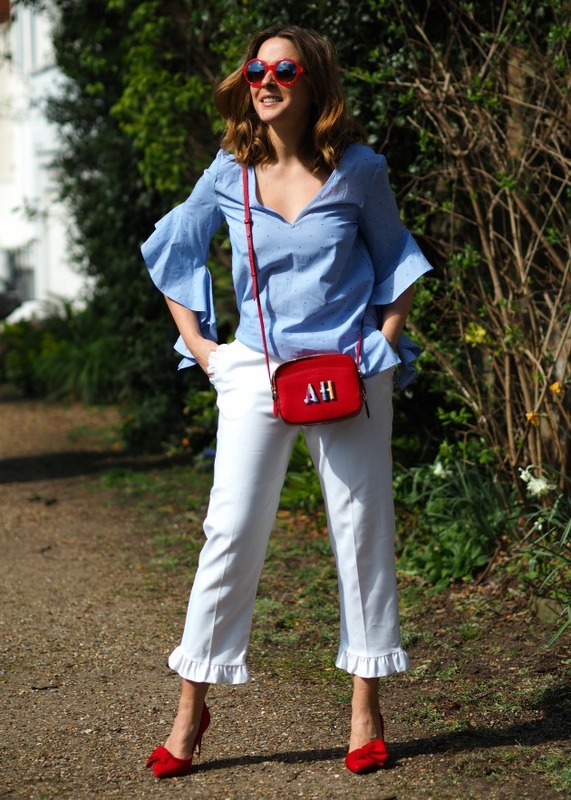 I don't really like my thighs, but the frills at the bottom almost balance them out - and they are slightly cropped meaning my ankles are on show (slimming). They're from their Limited Edition range, and you can find them in lots of colours as above. The top has proved to be a real winner and I've worn it a lot since this I took these photos. I love a floaty sleeve (and I should note that this doesn't need to be ironed, it comes out the washing machine looking just like this). The neckline is brilliant as it's open enough to be flattering, but you can still wear your normal bras with it, even the open back allows for it. 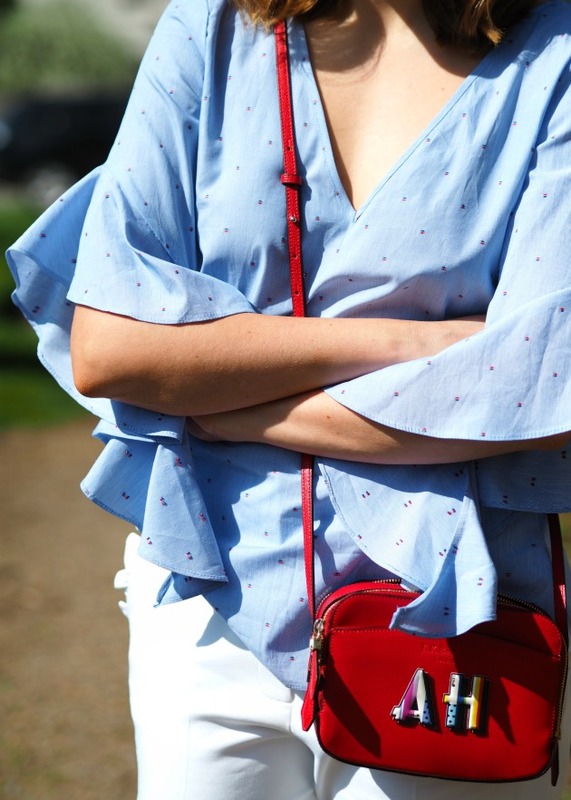 Blue is my staple colour for shirts and River Island has a tonne of good ones at the moment, I've listed my favourite below. As for the accessories, I went a bit all out with my favourite red bits. I usually shy away from "matchy matchy" but I found the sunglasses (previous season from Kate Spade, though they do have very similar ones again here). The shoes and bag are both L.K.Bennett, the heels being an update on the style I live in (the Floret) which are amazing for my little fit with the addition of a little bow at the front. I'm really craving wearing them with bright blue denim cut off jeans and I've just found a pair (here) from Dr Denim, Emma recommended them - cannot wait for them to arrive! This post was sponsored by Intu Digital, all copy and images my own. Photos taken using the Olympus PL7 at John Lewis here.